Supreme Court Allows 'Grandparent' Exemption To Trump Travel Ban : The Two-Way Justices upheld a lower court order that said grandparents and other relatives qualify as close family and are exempt from the Trump travel ban for citizens of six Muslim-majority countries. 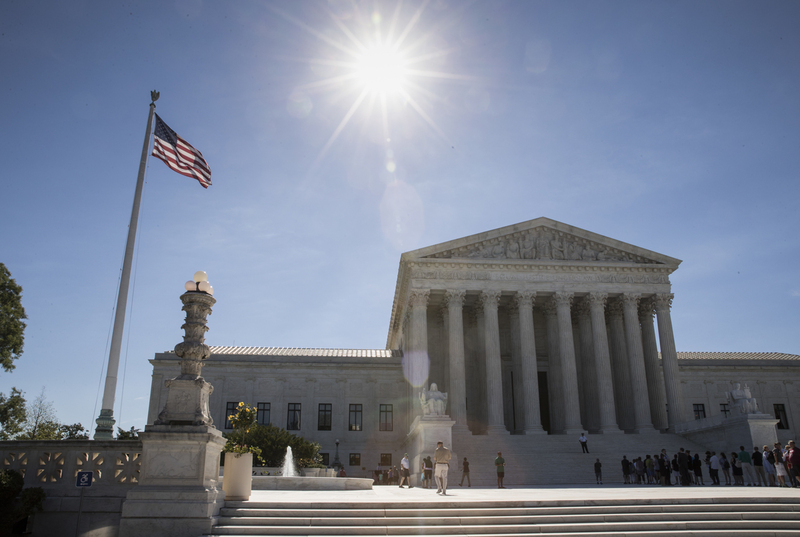 The Supreme Court left in place a lower court's broadened definition of close family members who could be exempt from the travel ban, including the grandparents and cousins of a person in the U.S. The Supreme Court has upheld parts of a lower court order that had widened the definition of which citizens from the six Muslim-majority countries covered by the Trump administration's travel ban are still eligible to travel to the U.S. The order issued Wednesday leaves in place the action of a U.S. District Court judge in Hawaii who broadened the definition of close family to include categories such as the grandparents and cousins of a person in the U.S. However, the Supreme Court blocked another part of the lower court order that said citizens with formal assurances from a U.S. refugee resettlement agency are eligible. Since the travel ban was introduced, defining which citizens from the six countries are exempt has been redefined multiple times. Last month, as we reported, the Supreme Court ruled that parts of the Trump administration's ban can take effect while the justices prepare to hear oral arguments on the case later this year. But the court said people from the six countries — Iran, Libya, Somalia, Sudan, Syria and Yemen — can be exempted from the ban if they have a "bona fide relationship" with a person in the U.S., including close family members. The legal question here is centered on how to define a "bona fide relationship." As we reported, the Trump administration argued that assurances from a refugee agency are "not sufficient" to constitute this relationship. However, the judge in Hawaii rejected this argument. "An assurance from a United States refugee resettlement agency, in fact, meets each of the Supreme Court's touchstones: it is formal, it is a documented contract, it is binding, it triggers responsibilities and obligations," District Court Judge Derrick Watson wrote. "Bona fide does not get any more bona fide than that." The Supreme Court justices, however, stayed that portion of the judge's order without elaborating. It sent the case back to the 9th U.S. Circuit Court of Appeals for a ruling. The Trump administration had asked the high court to settle the dispute, leapfrogging the 9th Circuit, which the justices denied without comment. The order said Justices Clarence Thomas, Samuel Alito and Neil Gorsuch would have stayed the entire lower court order, including the broadening of close family categories. Naureen Shah, Amnesty International USA senior director of campaigns, stated that Wednesday's order "jeopardizes the safety of thousands of people across the world including vulnerable families fleeing war and violence." Earlier this week, the State Department released new instructions to U.S. embassies and consulates to implement the Hawaii federal court's order expanded definition of close family to include grandparents, grandchildren, brothers-in-law, sisters-in-law, aunts and uncles, nephews and nieces, and cousins.